Beth Henley's Abundance, at South Coast Repertory through November 15, is a tale of women told by a woman. While her telltale dark humor elevates the story to a Tall Tale, she elevates our appreciation of women in the West through an even-handed, gender-neutral portrait of two couples that claims no better halves. The Mississippi-bred playwright's knack for black comedy – wrapping horrible misfortune with an absurdist twist – has been a signature since it helped so distinguish her debut, 1979's Crimes of the Heart, that it won the 1981 Pulitzer Prize for Drama. This 1989 work, back at the theater that launched it, is a more sober effort, further balanced by Director Martin Benson and a fine cast of five. 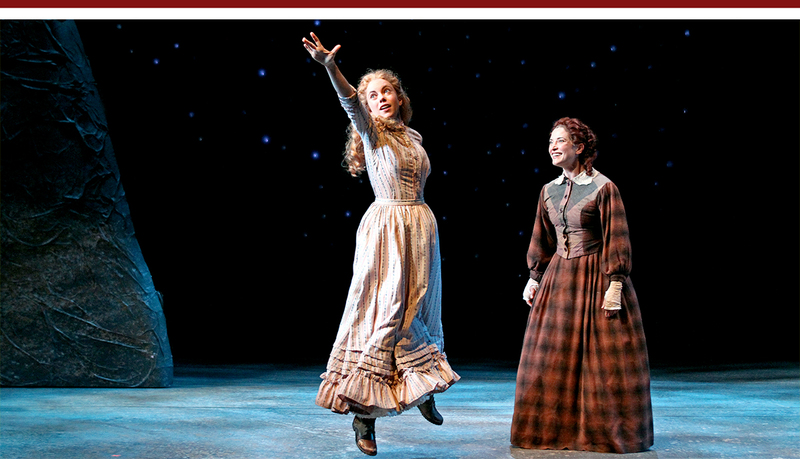 The play's central characters begin with unrealistically high hopes and end with humbled acceptance. The opening scene is a treat as Lily Holleman and Paige Lindsey White fill the stage with an optimistic energy. Bess Johnson (Holleman) and Macon Hill (White) are arriving for arranged marriages. Bess, literate and with a hypnotic singing voice, is the innocent. Reading has her anticipating a storybook love with an heroic man. She sings, "Angels in Heaven, know I love you . . . Build me a castle, forty feet high; So I can see him, as he rides by." The are lines from "Down in the Valley," a love song written, ominously, in an Alabama jail cell. The song ends as Macon blows in like a funnel cloud. She's bursting to make a new life of adventure. While they await their late husbands-to-be the women befriend one another with the openness and candor they will soon need to shutter. We're "going to see the elephant," she says. The popular expression of that era originally referred to the arrival parade by traveling circuses, who would march down Main Street with their exotic animals. But its use out West, in a land without elephants, carried a built-in projection of disappointment. The enthusiasm of the newly arrived women dissipates into the dryness surrounding the men who come for them. Bess' tardy husband-to-be is the late Michael Flan, whose brother Jack (Adam Haas Hunter) begrudgingly will serve as successor. Macon's intended, William Curtis (Daniel Reichert), is a mild-tempered man minus an eye axe-pecked by a miner. It was "an honest mistake," as he sees it, "no violence or malice intended." Their cramped cabins become crucibles for crushing the women's dreams. Bad luck is as much to blame as bad decisions. But Hunter's Flan, a rangy coyote of a man who takes as much as he can while giving as little as possible, is a particularly bad stroke. After stifling his bubbly wife's songs he turns his attention to Macon, who quickly lost interest in her own husband. She allows Jack's rough advances a soft landing. Macon continues to preach of abandoning the men and continuing further west just as she commits deeper to the farm and Jack. When it seems that the strong Macon and self-serving Jack are bound inevitably to succeed, things take a surprising turn. During a moonlit flower-hunt after she realizes the deception, Bess is kidnapped by Sioux. When she is finally freed and returned home, her story of survival reaches New York literary agent Elmore Crome (Larry Bates), who helps her publish a bestselling autobiography. It suddenly makes her a national figure in a way that Henley understands from Crimes of the Heart's success. In Abundance, fortunes are won and lost and love remains an imitation of something imagined. Both farmers and dreamers will leave no scratch on their unyielding earth, while the lenders will call in the delinquent loans to reclaim the land like a prairie dust storm. And yet, in their final moment of reclaimed sisterhood, Macon and Bess will return, wordlessly and wiser, to their music, finding peace in friendship and forgiveness. Benson's production team includes scenic designer John Iacovelli, costumer Angela Balogh Calin, lighting designer Lonnie Rafael Alcaraz, and composer/soundscape designer Michael Roth. Casting director Joanne DeNaut made her usual excellent contribution, adding newcomer White to a cast of four SCR veterans. Stage managers Talia Krispel and Jessica Aguilar keep the many shifts moving smoothly. 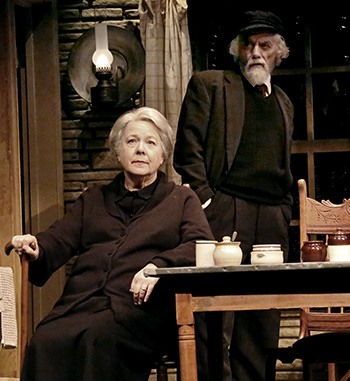 Seeing John Patrick Shanley's Outside Mullingar, at the Geffen Playhouse (through December 20), days after a fine production of Uncle Vanya is as useful as it is unfair. 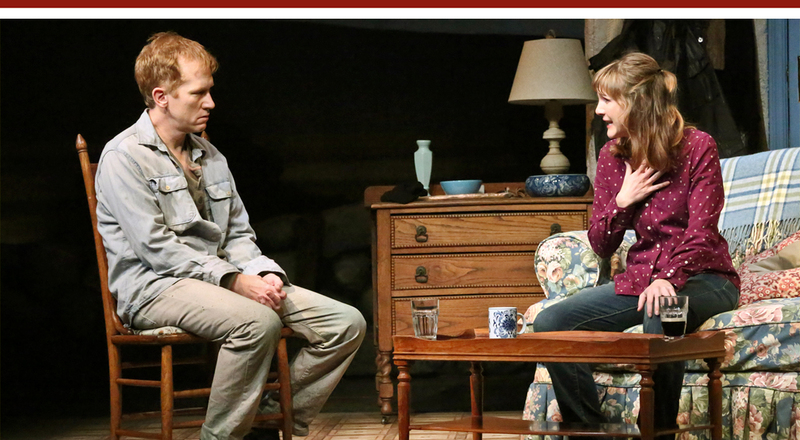 Both plays must strike just the right balance between humor and pathos. 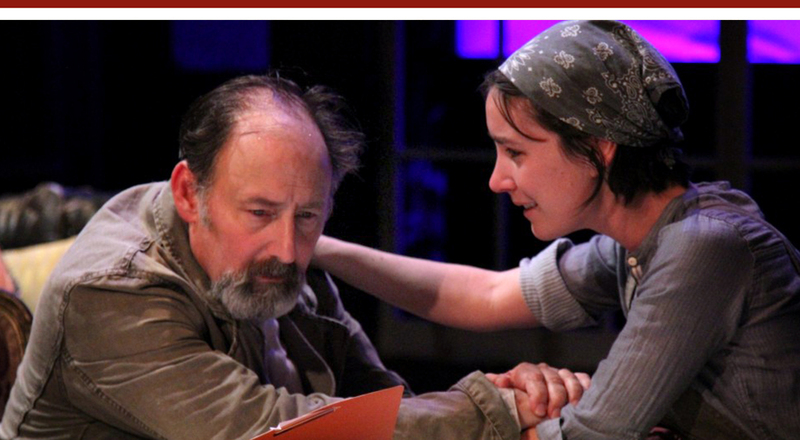 And while Chekhov's 1897 script rises on its mix, Shanley's 2014 prize-winner ends prostrate under too much weight. It's nearly two years since the Manhattan Theatre Club premiere earned Mullingar a validating review from the New York Times and then a Tony nomination and an Edgerton New Play Award. Here, despite a top cast led by Geffen Artistic Director Randall Arney, the play's landscape seems to stretch beyond its yield and its deus ex machina ending, with a splash of O. Henry for good measure, just seems an emergency exit off a long circular drive. With his father born and raised on ancient Irish sod like that upon which the play is set, Shanley's childhood had the mother tongue ringing in his ear. But when he became a writer, as he explained in a January 2014 New York Times piece, he self-censored any Irishness to protect the work from charges of ethnic reliance. It wasn't until hitting 60, and a midlife depression, that he found the way to see beyond life's dead end was to look back to where it began. He visited the Ireland of his ancestors and the result was Mullingar. On a farm in Killucan, about a quarter the distance from Mullingar to Dublin, the Reillys have cultivated the land and raised their cattle. With a sly wink and a telltale twinkle, those who scratch their living from obstinate earth tell stories to dispel the tedium and suffering. For Shanley, with death and decades of life wasted the primary themes, getting that twinkle is crucial. Lights rise on Tony Fanning's multi-location set as Tony Reilly (Jarlath Conroy) and his 42-year-old son Anthony (Dan Donohue) return from the funeral of longtime neighbor Christopher Muldoon. While waiting for Muldoon's widow, Aoife (Robin Pearson Rose), and daughter Rosemary (Jessica Collins) to join them, Tony tells a story that stakes out the play's tone. It involves a couple pub denizens, confused by Tony's claim that Chris Muldoon had died twice. In fact, the first was an unknown son with the same name, who was "born half size and shrank from there," dying within weeks of birth. Similarly, Anthony bears his father's name and continues to shrink emotionally, largely from his old man's belittling. "You don't stand on the land like a King," Tony tells him, setting a high bar for the caretaker of an undistinguished plot in the middle of nowhere. He cruelly hints that he may bequeath this farm, to which Anthony has devoted his life, to an American cousin. Rosemary, meanwhile, is an independent force of nature who has maintained an inexplicable, nearly three-decade devotion to Anthony since he knocked her down on his 13th birthday. He never made another move on her, which late in the play he attributes to rejection from his first (and only) love interest (though he later dismisses that). He then confides that what really kept him was a form of hallucinatory self-perception worthy of Kafka. Overdue disclosures allow them to finally come together as, the play, without the storyteller's twinkle, comes to rest rather than ends. What Shanley has going for him is rich dialogue that celebrates the legendary Irish turn of phrase. Mullingar is a showcase of colorful expressions that, like burnished stones, seem to have been passed around for generations. There's insight in the eloquence, as when Aoife laments, "Was I only born to bury and be buried?" Charles Isherwood's Times review suggests the script worked well enough in New York for him to overlook a weakness in the resolution that here it failed to overcome. "Mr. Shanley must resort to some exotic stratagems . . . ." "The reason for [Anthony's earlier] rejection, when revealed, is fairly preposterous, albeit amusingly tinged with Irish whimsy." While Collins is winning and Donohue grounded, and both Rose and Conroy give their characters richness, for me, the wink and twinkle of Irish whimsy remained outside Outside Mullingar. 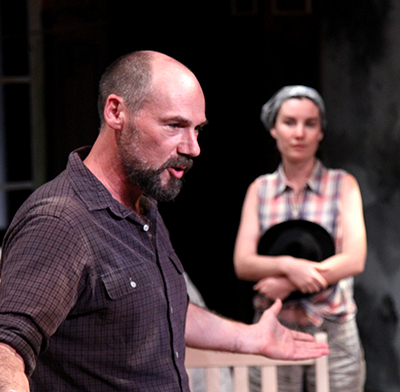 HISTORY Premiered at the commissioning Manhattan Theatre Club in January 2014. Winner of 2014 Edgerton Foundation New American Play Award. In curtain speeches and fundraising materials, Antaeus Theatre Company boasts it does a lot with a little. It's clearly a reference to material and financial resources, not artistry. 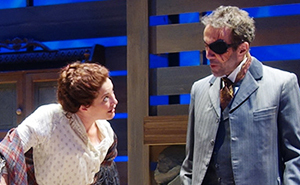 As Robin Larsen's current staging of Chekhov's Uncle Vanya (through December 6) shows, with two alternating casts of comparable credentials, the Antaeus acting company is an embarrassment of riches. The humor serves to underscore the pathos, which has not been shortchanged. 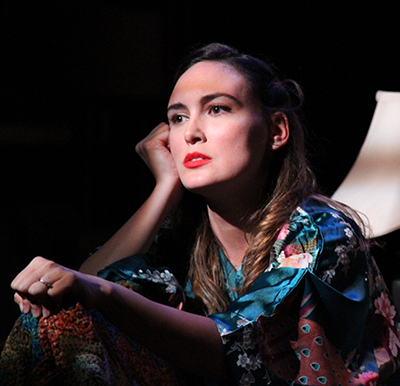 The pervasive sense of disconnection and otherness begins with the play's title, which, like Balzac's Cousin Bette (another success here in 2010), suggests a main character defined in relationship to others. 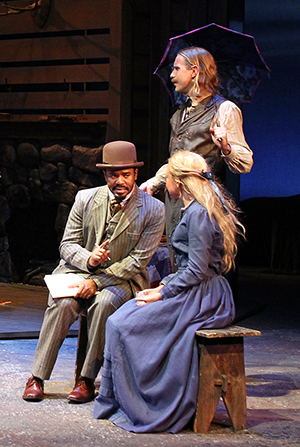 Uncle Vanya's plot is the subtle shift in the relationships between characters, brought on by changing perceptions of themselves and each other. Sonya (Shannon Lee Clair) lives on a country estate with her grandmother Maria (Anne Gee Byrd) and Uncle Vanya (Arye Gross). It had passed from her grandfather to her uncle and late mother. Vanya forsook his share to speed paying off the mortgage in one of several selfless acts he has come to regret. Another is how he enabled the career of Sonya's father, Serebryakov (Harry Groener), a professor whose academic writing career he now mocks. The professor, elderly and constantly complaining of gout, has recently moved into the large house with his younger second wife, Yelena (Rebecca Mozo), after dwindling earnings became insufficient to support their city lifestyle. There are no happy loving couples among the characters. Any love proclaimed is suspect, borne of desperation, and either unrealistic, unrequited, or both. It's most acute in Sonya and Vanya, who continue to dedicate themselves to maintaining the estate. While Vanya is infatuated with Yelena, and publicly professes an abiding love, Sonya's worship of Astrov (Andrew Borba), a physician and forester who lives nearby, is shared only with Yelena. Tellingly, while Vanya's feelings prove foolish Sonya's never do. When the professor suggests his daughter sell the estate and invest in securities that would revive his income, Vanya explodes. Though hardly out of character, the professor's idea pushes his former brother-in-law into a rage fueled by his sense of being unappreciated. He tries to shoot the professor, but fails. Meanwhile, Yelena's attempt to measure the doctor's feelings for Sonya backfires when he instead professes his love for her. The nuances of these various pairings come naturally to a company that nurtures relationships among its artists. And while the evenly excellent cast shines throughout, it is unquestionably a showcase for Mr. Gross. He gets the balance right. His exclamation about missing the professor twice earns its laughs honestly. This Vanya isn't morose and gloomy from the beginning but dissatisfied and looking for change. There is an energy borne of hope – misguided but real to him. He is more confident and his flirting is not laughable. Larson utilizes the music of composer Marvin Etzioni to great effect. They help establish an American folk atmosphere, with Clay Wilcox, as Telegin, expanding on Chekhov's call for guitar music with beautiful lyrics that complement the story. And, as a final testament to company resources, at this performance Alicia Wollerton, not part of the cast or even the company in the program (though she played Cousin Bette in 2010), was available to step in as Yefin, playing accordion and singing along.